Dean from Australia: Picture In A Frame. I returned home from my summer holiday (which I'll share more about in the coming weeks) knowing that a parcel would be waiting for me on my door step. I have come to regard it as a belated Christmas present to myself. Last year, I happened across a really cool Kickstarter project with the curious title of "I Want To Take A Portrait Of Eddie Vedder". Being a supreme Pearl Jam fan from their very beginnings, I clicked on through to the project itself and discovered that it was the brain child of a fellow Adelaidean and Pearl Jam devotee, photographer Jennifer Sando. Jennifer's mission throughout 2010-2011 was to attract the attention of her personal hero, Eddie Vedder, via an ingenious social media/web campaign. 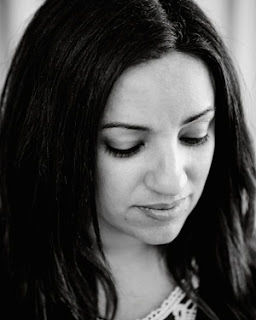 Through the medium of photography, of which Jennifer has an exquisite skill, she slowly but surely built the momentum, attracting the support of fans world wide as well as some heavy hitters close to Pearl Jam themselves. It culminated in what can only be described as a once in a lifetime opportunity to spend time with Eddie Vedder himself just prior to his March 2011 show here in Adelaide and take his portrait. The experience can only be described as a religious one. 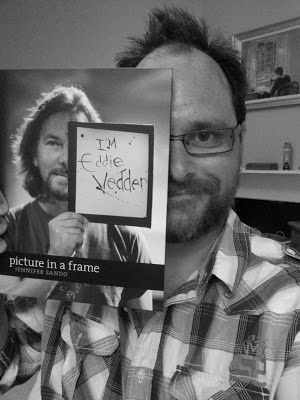 Not only was Eddie Vedder gracious, generous, funny and charming, he dedicated a song to Jennifer Sando with the apt title "Picture In A Frame" during that show at the Thebarton Theatre. The journey is now immortalized in the sumptuous hard cover title "Picture in a Frame" which chronicles the photographic journey Jennifer took. As a backer of the project, I received a personally signed copy from Jennifer as well as a lobby card, a colour print of Eddie Vedder from the shoot, a book mark and a guitar pick with the cover imagery. The book speaks through it's imagery though it does have some written recollections from Jennifer herself as well as people close to the project as it began and traversed the path towards its rather heart warming conclusion. It is truly a must for any discerning Pearl Jam/Eddie Vedder fan. Of all the gorgeous projects that I've kicked in for via Kickstarter, "I Want To Take A Portrait Of Eddie Vedder" is perhaps one of more quirky but certainly one of the most endearing and fist pumpingly inspiring projects I've seen. "Picture In A Frame" can be purchased now via the Official Portal that has been set up for the book. Connect with Jennifer Sando via her Official Site. Follow the books history here.